Researchers at the University of Zurich and Harvard University have developed a new strategy in the search for psychoactive drugs. By analyzing the behavior of larval zebrafish, they can filter out substances with unwanted side effects right from the start. This method has resulted in the discovery of a number of new appetite modulators. Many drugs that take effect in the brain have unwanted side effects. The appetite suppressant Rimonabant, for example, can cause anxiety, depression or even suicidal thoughts, which is why it was taken off the market. "Brain structures are highly complex, which raises the question of whether it's possible for a drug to trigger only one very specific behavior," says Josua Jordi, researcher at the UZH Institute of Veterinary Physiology. To answer this question, he joined forces with US researchers to develop a novel testing system for psychoactive substances. Unlike previous biochemical tests, the new testing system instead uses the larvae of zebrafish, which are about four millimeters long. The biology of these tropical fish is well characterized, and they can be bred quickly in large quantities. The researchers established an automated measuring process so that they could analyze the behavior of several thousand larvae at the same time. This involved feeding fluorescent paramecia to the fish in order to quantify their feeding behavior—the more fluorescence there is in the larva's stomach, the larger their appetite. The researchers also developed similar methods for a number of other behaviors, including the fish's reaction to light and sound, or simple learning tasks. Experiments with known active substances confirmed that the system works. For example, nicotine was found to reduce the larva's appetite while increasing their activity. This is in line with the effects nicotine has on many animals, as well as on humans. 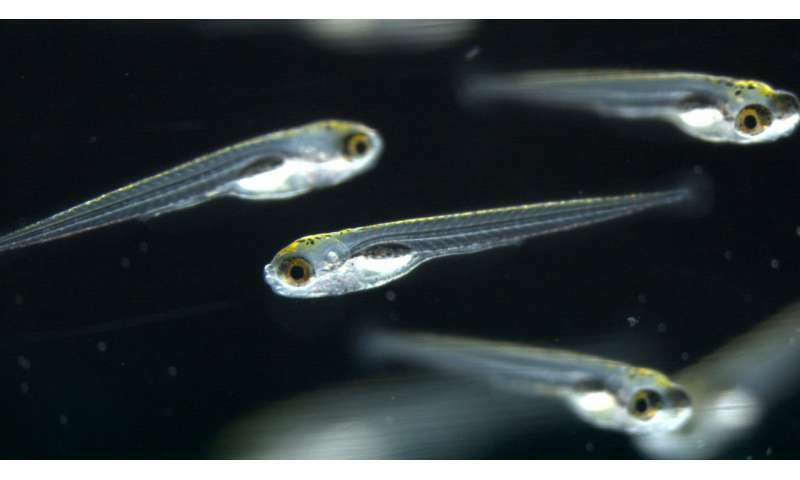 In their large-scale experiment, the scientists searched for appetite modulators and determined the effects of more than 10,000 small molecules on the behavior of larval zebrafish. They found more than 500 substances that either increased or suppressed the appetite of the larvae. However, only about half of these had the specific effect of only modulating the animals' appetite; the other half resulted in additional behavioral changes. "By analyzing several behaviors in parallel, we were able to filter out many substances with non-specific effects from the beginning," says Josua Jordi, first author of the study. "We were very happy to see that right away, our approach had the desired effect." Next, the researchers investigated the biological mechanisms of 22 of the most promising substances. They found that some of these substances had an effect on the activity of key neurotransmitters in the brain, such as serotonin or histamine, which is precisely how many of the existing appetite modulators unfold their effects. "The crucial finding, however, was that most substances didn't interfere with any of these known systems," says Florian Engert, last author of the study and professor at Harvard University. This points towards new molecular mechanisms that regulate appetite. To demonstrate that this not only works in fish but also in higher life forms, UZH professor Thomas Lutz and his team at the Institute of Veterinary Physiology tested the most promising appetite modulators on mice. The researchers found that these substances had the same effect on the feeding behavior in mice than they did in zebrafish larvae, and that in comparison they worked more selectively than any known appetite modulators. Josua Jordi now wants to find out whether these results can be transferred to humans. "As far as we know, there are no comparable psychoactive molecules that have such a strong and specific effect as the ones we tested." He believes this will open the door to a whole series of clinical applications such as treatments for obesity or anorexia—and possibly without the risk of adverse side effects. Since their search for specific appetite modulators has proven so successful, the researchers now plan to use the new method to look for further psychoactive substances such as antidepressants. To pursue these promising approaches, Jordi and some of his fellow researchers have established the start-up business EraCal Therapeutics.